Michael Morsberger, the head of GW's fundraising office, said he was disappointed by the slow growth of fundraising for the $275 million Science and Engineering Hall. The University has collected $200,000 over the last five months out of $75 million needed for construction. If you walk past the corner of 22nd and H streets and look up, everything looks on schedule for the Science and Engineering Hall. 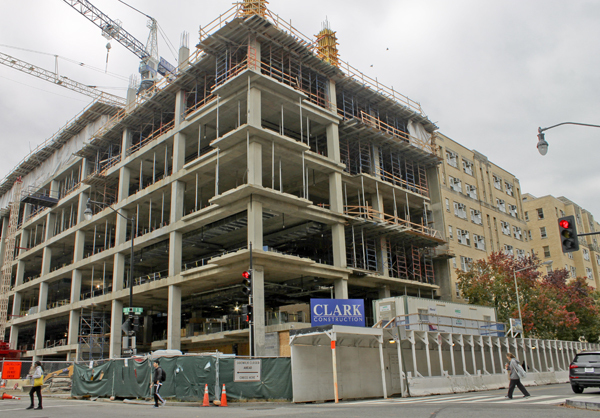 But progress on paying for the $275 million building has stalled. Over the past five months, GW raised less than 1 percent of the $75 million it will need from outside sources to pay for its priciest building ever. With $200,000 raised since June, the University now counts a total of $7 million in donations for the building that has reached seven stories in the past five months and is on pace to open in about a year and a half. While he’s seen more interest from donors as they notice the rising building, he told the Faculty Senate earlier this month that he was disappointed by the totals. Two years ago, the University projected it could fundraise $100 million alone for the project. Morsberger said the next 18 months will be crucial, because once the building is completed, few additional donations will come in. That would put more financial pressure on GW, which accumulated debt to build the hall. The University expects to pay it off over the next decade with donations, research dollars and revenue from The Avenue, located across the street. Morsberger said he’s received far more gifts that are earmarked for scholarships and endowed professorships than supplies and labor for the building’s construction. The University raised $1.5 million for the science and engineering programs over the last five months, but only a fraction can be used to pay for construction. The University has already started planning how to offset the tepid fundraising for the building. Last May, the University’s treasurer announced that GW would look to use $200 million instead of $100 million from its real estate investments in The Avenue, leaning less on fundraising. Now, GW has set a target of $75 million to reach through a combination of fundraising and federal funds, called indirect cost recoveries. Morsberger said he does not know exactly how much of that total will need to come from fundraising, but said that total will be pinned down before the University launches its campus-wide fundraising campaign of at least $1 billion by the end of the year. He said his team has reached out to dozens of foundations and corporations to fund lab spaces within the building. But those prospects likely won’t help bring in dollars towards the building’s construction because most want their donations to directly benefit students who they can later employ, Morsberger said. David Dolling, dean of the School of Engineering and Applied Science, said while donors understand how the building will help the school’s research profile, they’re more attracted to the programs and scholarships. Dolling spends at least 40 percent of his time fundraising under a policy set by University President Steven Knapp four years ago. He declined to say if he was disappointed with the current haul. He also declined to provide how much the school has raised over the past three years. Some professors in the school said they were concerned that development officers and administrators are not doing enough. Assistant professor of civil engineering Leila Farhadi said she was worried that the school will not reach its goal in time. She said she was also worried about sub-par funding for endowed professorships or student programs. “I would like to see people more interested in science and being interested in developing the University, and making it go forward in the sciences direction,” Farhadi said. This article appeared in the November 18, 2013 issue of the Hatchet.